Afternoon tea at Cocolicious in Kent. As Afternoon Tea Week approaches I thought I would bring you a gem of a tea from my favourite cafe. In the UK afternoon tea has a unique place in our hearts, and the elaborate meal that has developed to fill the unscalable gap between lunch and supper can be a very special thing indeed. Sadly, because of the worldwide fame of our afternoon tea ritual there are a plethora of formulaic, badly executed excuses for it in hotel dining rooms and village tea shops throughout the nation. It isn’t that we want innovation, at least not for its own sake, the inclusion of cucumber sandwiches and scones is what we expect and long to find. But a really good afternoon tea is the creation of a really good patissier, not tired but a thing of beauty and delicate wonder. The scene is set, I am giddy with anticipation. Patissiers being close cousins to chocolatiers, and frequently one is born out of the other, I revere and wish to celebrate both. The patissier of worth can also be one of the finest and most important creators with chocolate. So, in anticipation of Afternoon Tea Week, a week dedicated to the celebration and enjoyment of what can be a divine meal, I wanted to review a really special tea for you. 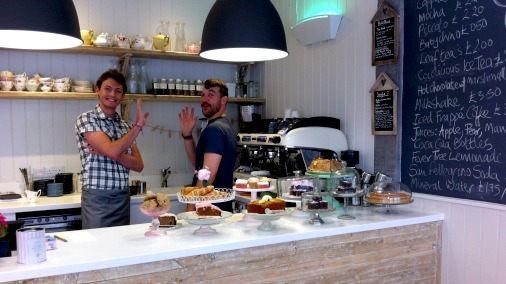 Cocolicious is a wonderfully pretty and convivial café/patisserie in a the historic small town of Cranbrook in the midst of beautiful countryside in the Weald of Kent. Chef/patron Lucinda Hamilton, who learnt her craft under Anton Mosimann, after Les Roches hotel school in Switzerland, has put the culmination of all her combined work experience to date to create her ideal venue. Working front of house at the Ritz and running client dining at a major law firm, combined with her hotel and chef’s training, have helped her create an elegant, yet informal space, with a warm welcome. And at its heart is quite delicious food. Daily salads and lunch specials join the too-tempting array of cakes and expertly crafted coffee overseen by head barista Andrew Murray. 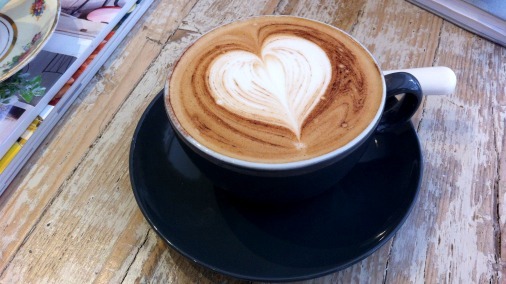 Made with love, the coffee tastes as good as it looks! 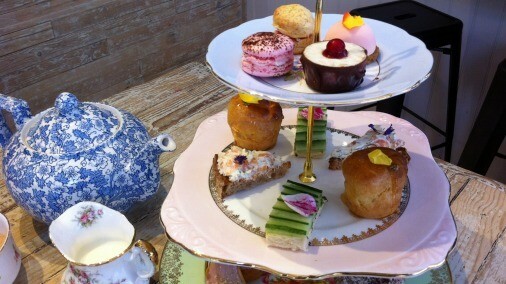 The new, more formal, afternoon tea has been created to allow customers even more of a treat. It is available any time of day and requires advance booking of 48 hours. It has proved a glorious new collaboration between Lucinda and her head chef; classically trained pastry chef Ginny Felton, and her best friend and sous-chef Sarah Kirk. My menu, forgive the crumpling, that was me taking it home as a souvenir. Accompanied by a bottomless pot of good Earl Grey tea I sampled treat after treat. Read on and feel the temptation! My tower of lovely things arrives. Everything at Cocolicious looks delicious and has an informal elegance about it that makes it feel like a treat. And that is before you take the first bite! 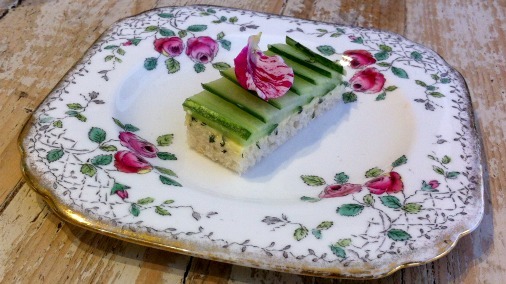 The best little cucumber sandwich I can imagine. By rethinking this afternoon tea classic as an open sandwich and adding fresh mint to the butter, the balance and lightness of flavours is a distinct improvement on the original. The bread is soft, the cucumber cool and crisp, a hint of salt and mint join the creamy butter in both evoking the familiar and breathing lovely new life into it. A small and simple thing, but perfectly formed. I could eat a plate of these. 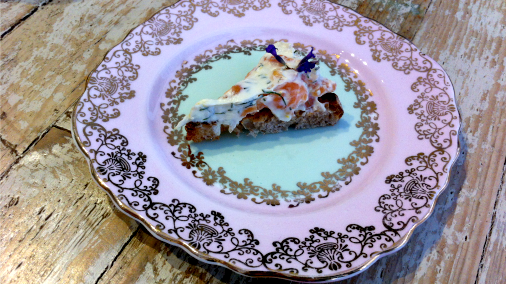 Roasted smoked salmon with dill, cream cheese and toasted sourdough. The crunch and chew of a good crusty sourdough, salty, tangy, fish, cooling cream cheese and the fresh perfectly complimentary green note of fresh dill. Perfect. 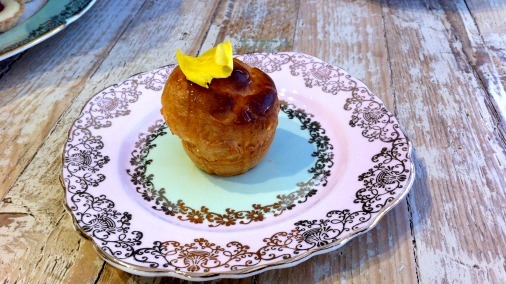 Profiterole with goat’s cheese & honey mousse, honey & thyme glaze. 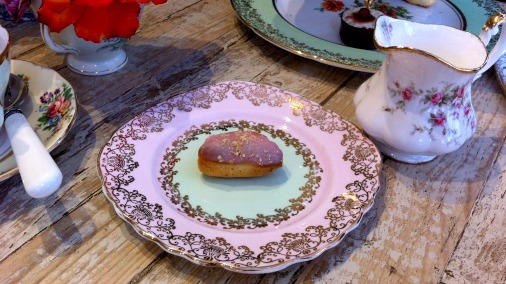 I was hugely impressed by the choux pastry, both here and in the eclair. It is ultra fine, crisp, but melting. None of the doughy thickness too often found. Inside is a lightly whipped goat’s cheese, whose milky earthiness is a well balanced with the crisp shell. 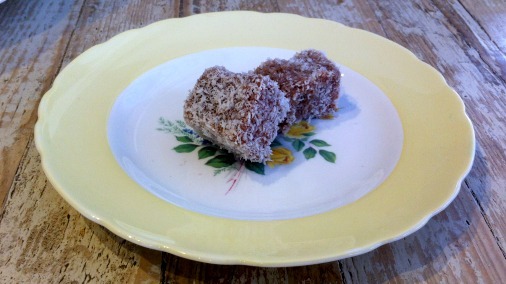 A cube of super-airy sponge, moist from its dipping in a cocoa, butter, icing sugar and milk glaze, nicely crusted in coconut. A delicate, light, sweet little square of cake. 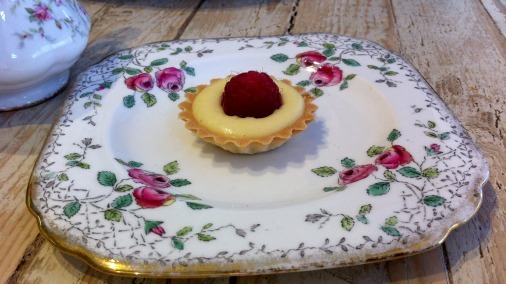 Raspberry tart with creme patissiere. Firstly, this is adorable. Secondly, but at least as important, it is a fondant, ultra-smooth creme patissiere inside a crisp, fine-as-you-could-want pate sucree case. The sweet, sharp fruitiness of one perfect raspberry is all it needed to top it off. Tart with chocolate creme patissiere. The darker cousin of the raspberry tart, this is still delicate in flavour. 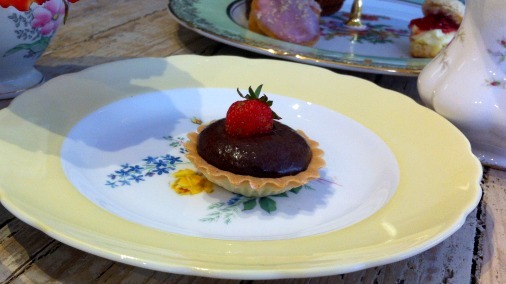 Not an after dinner chocolate tart, but the afternoon tea version, with a lightly chocolatey creme patissiere. I love the simple flavour and buttery bite of a perfectly executed pate sucree, this certainly is one. White chocolate and hazelnut eclair. In beautifully fine choux pastry, adorned by only the finest coating of icing to prevent this being too sweet, is a nutty burst of fresh cream. This is well flavoured, hazelnut and white chocolate being natural partners, and has a nice texture, with shards of nut nestling in the light cream. An iced cake, in effect, but managing to be neither too sweet, nor rich. Unassuming looking, but a sophisticated little mouthful. Sweet sushi with a chocolate case. This sweet sushi is one of the items on the menu with no precedent for me. No rewriting of a classic here, but a new invention. A cool and creamy rice pudding is encased in a wonderfully deep and fruity Valrhona Manjari 64% shell. It turns out that these two are perfect partners, comfort and something altogether darker, melting into one another. The bright acidity of the berry on top enhances the natural red fruit notes in the chocolate and lifts the whole. Very clever indeed. 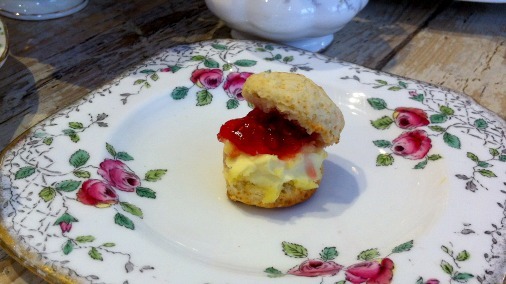 Mini scone with clotted cream and raspberry jam. Scones matter to me. I adore them, and they need to taste good, not just look the part. This does. The jam is homemade raspberry, from Lucinda’s mother-in-law’s family recipe. The cream is clotted, with that unique good rich dairy taste. But the scone is the thing for me. I could eat them unadorned by the basketful, sacrilege I know, to the afternoon tea crowd. This one is a micro-scone, a mini mouthful, but it is nonetheless a very good, plain scone, tasting exactly as it should do. And that is a very fine thing indeed. Fudgey, coffee and ginger rich interior, chewy/crisp exterior. 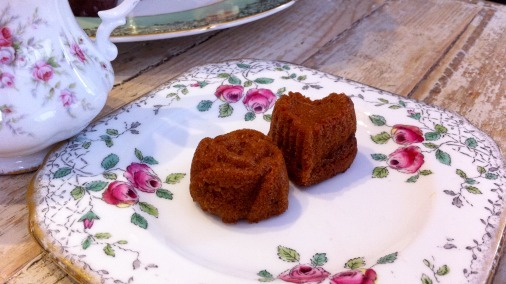 This is a gorgeous little love match between cake and something in the toffee family. 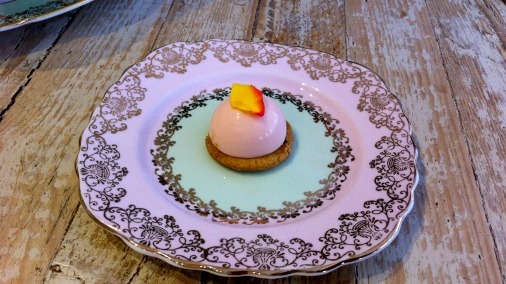 Rose pannacotta on cardamom shortbread. Another new one on me, this is wholly successful. A cool, ultra-smooth dome of pannacotta, with expertly judged wobble, has just a whisper of rose. No soap here, just the whiff of a few petals as your nose brushes past a flower in its dew-soaked prime. This tops a meltingly-good disc of short, super-buttery, lightly spiced shortbread. Very very good indeed! Chocolate macaron with pistachio filling. 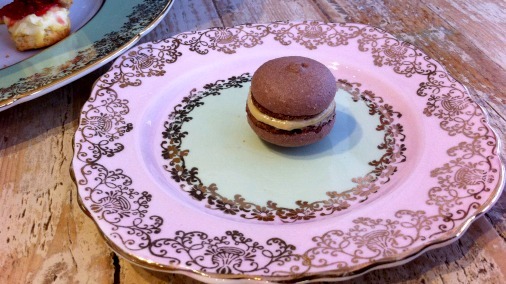 Lucinda makes many different flavours of macarons, all are accomplished. A fine crust gives way in the mouth to an almond-rich chewy interior and then a soft creamy centre. This one combines a shell with gentle hint of cocoa and a pistachio rich cream. 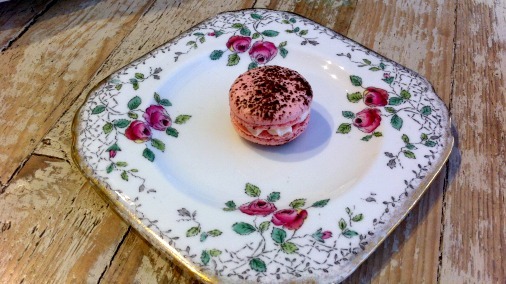 A macaron in pink, the signature Cocolicious colour, with white chocolate cream . Cocolicious is pink, not in-your-face bubblegum, it isn’t Barbi, it is far more demure, it is delicate blushing. Pink is Lucinda’s signature colour, and she wears it well. This little macaron with its pink shell, and its smooth, not-too-sweet white chocolate interior, wears it well too. 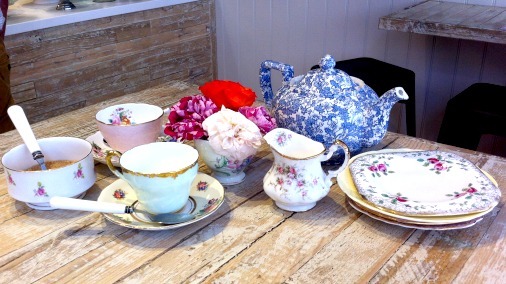 This afternoon tea absolutely charmed me. It is pretty as a picture, and delivers, both on taste, which is essential, and on the kind of delicate technical pastry that does make you feel you are having more than tea and cake. A little celebration, a treat, a succession of well thought out, happy little moments to be savoured. 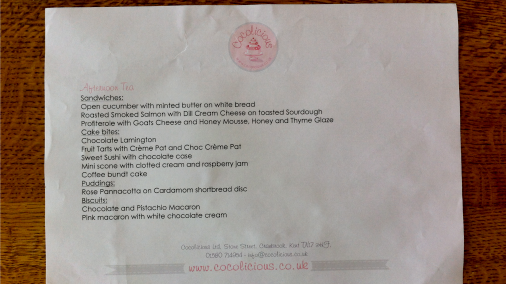 The afternoon tea at Cocolicious is available now, and at £19.50 is a proper bargain in my view. You will get fine leaf tea, and 12 little goodies. The exact menu may vary from that I received, as chefs will be chefs and must allow for ingredient availability and their own creative leanings. But if you can book yourself in I am sure it will be worth it. 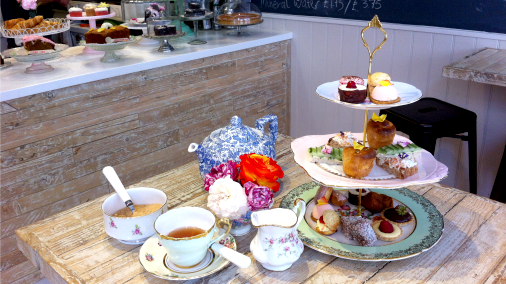 They will also be taking part in Afternoon Tea Week, which runs from the 11th-17th of August. 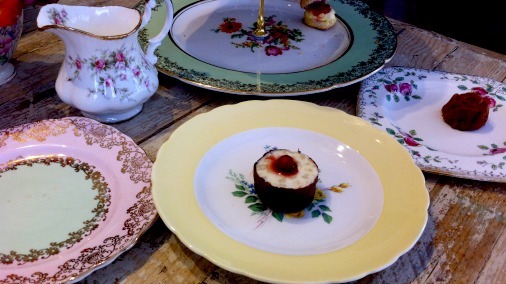 For more on Cocolicious and Afternoon Tea Week see the links below.